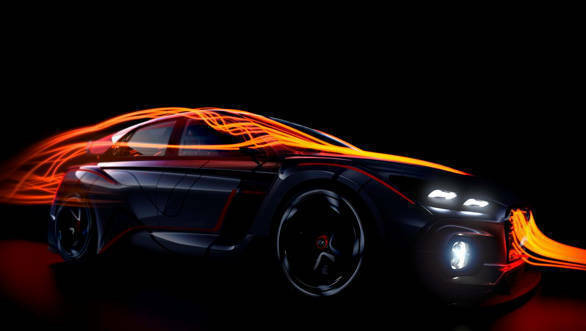 Hyundai Motor has revealed a teaser image of the RN30 concept which will be showcased at the upcoming 2016 Paris Motor Show. Based on the all-new Hyundai i30, the RN30 concept has been jointly developed by Hyundai's motorsport, European technical center and performance vehicle division. As the name suggests, the RN30 concept is expected to be the performance version of the i30 which will launched under the N brand. As the teaser image reveals, the RN30 concept gets an aggressive design theme with a wide front grille and flared wheel arches that cover wide tyres. The chunky looking bumper houses large LED foglamps while the LED headlamps get a double barrel arrangement. In an official release, the carmaker has said that the N concept RN30 will be unveiled on September 29 at the Paris Motor Show along with the i30 and the new i10. Hyundai hasn't revealed the engine and transmission details of the RN30. While revealing pictures and details of the 2017 i30, the company had stated that it will introduce a performance version under the N brand. In global markets, the production version of Hyundai's RN30 concept will compete against the Volkswagen Golf GTI and the Ford Focus ST.